Mateo Cerezo was born in Burgos in 1637. He received his earliest training from his father, the Caravaggist artist of the same name. His talents becoming obvious at an early age, he decided to complete his studies in Madrid where he arrived at a very young age, possibly around 1654. It is not known for certain whether he entered the studio of Juan Carreño de Miranda (1614-1685) 1 or that of Antonio de Pereda (1611-1678). 2 His earliest work shows some dependence on that of the latter, for example, the paintings now in the monastery of Jesús y María in Valladolid. From 1660 onwards the influence of Carreño and Alonso Cano became more obvious in his painting and Cerezo directly borrowed some of Cano’s figures and physical types in his works. As a result Cerezo evolved from a provincial style characteristic of Burgos to a more refined, courtly one, and a work such as The Mystic Marriage of Saint Catherine (Museo Nacional del Prado, inv. no. 659) offers an excellent example of this evolution. Works of this period manifest a more dynamic, colourful style with more open lines and a new emphasis on the settings. Also notable are the richness of the details in the play of light and shade and the splendid clothing of the figures, the latter indicating his new knowledge of the work of Titian and Van Dyck, acquired via Carreño. Cerezo’s graceful, vibrantly colourful paintings soon attracted a wide-ranging group of clients. He received commissions for still lifes, 3 of which a good example is the series now in the Arasjauregui collection in Bilbao, as well as religious compositions. From 1662 the artist received numerous commissions for small works of private devotion. These include his numerous versions of the Ecce Homo (Budapest Museum and Arenaza collection) and of Mary Magdalen (Rijksmuseum, Amsterdam, Museo Lázaro Galdiano, Madrid, and Granados Collection). Above all, Cerezo was commissioned to execute large-scale altarpieces for churches and religious houses such as those he painted for the Barefoot Carmelites of San Hermenegildo in Madrid, for San Francisco in Valladolid and for the royal monastery of Santa Isabel and the Agustinos Recoletos in Madrid. 4 Cerezo died young in 1666 at the age of twenty-nine and was buried in the parish church of San Millán in Madrid. The present drawing may be a preliminary design for one of the large canvases that Cerezo painted for the monastery of Santa Isabel in Madrid. It is particularly striking for its use of a light, rapid stroke of undulating lines with little attention paid to the definition of forms or shadows. 5 Combined with the use cross-shaped, receding perspectival lines, the effect is to create a sense of dynamism that is unusual in altarpieces created in Madrid at this date. Cerezo received the commission to produce three works for Santa Isabel in 1664, namely Saint Thomas of Villanueva giving Alms and Saint Nicholas of Tolentino and the Souls in Purgatory for the altarpieces in the crossing, and a Visitation for the top of the high altar. His compositions were extremely well received and Palomino described them as “truly superb, achieving the highest levels of excellence in art, both in drawing as well as in colour.” 6 The present sheet may be a sketch for the lost painting of Saint Nicholas of Tolentino, of which the appearance and composition is known from old photographs. 7 There are various differences between the final canvas and the drawing. While the figure of Saint Nicholas occupies the upper part of both, in the canvas the saint interacts more actively with the Souls in the lower part by leaning his head more towards them and thus defining one of the compositional diagonals in a more pronounced manner. In addition, while the Souls in Purgatory are devoured by flames in both works, there are a number of differences in their poses and locations. 8 On the reverse of the present sheet is a very rapid sketch in black chalk for one of these figures. With its muscular body, it makes an unusual gesture with its hands clasped to the right in supplication. The same figure but seen from behind appears in the foreground of the final canvas that Cerezo painted for Santa Isabel. In his Lives of the Artists Antonio Palomino stated, “thus he came to Madrid when he was barely fifteen and entered the school of Don Juan Carreño, where he continued with the study of painting […]” (Palomino de Castro, Antonio, El Museo pictórico y escala óptica. II. Práctica de la Pintura y III. El Parnaso español pintoresco y laureado. Madrid, 1715-1724 [Madrid, Aguilar, 1947], p. 977). Buendía, José R. and Gutiérrez Pastor, Ismael, Vida y obra del pintor Mateo Cerezo (1637-1666). Burgos, 1986, pp. 27-28. Palomino refers to the fact that Cerezo painted “small still lifes with such outstanding excellence that no one surpassed him” (Palomino de Castro, Antonio, El Museo pictórico y escala óptica. II. Práctica de la Pintura y III. El Parnaso español pintoresco y laureado. Madrid, 1715-1724 [Madrid, Aguilar, 1947], p. 978). For more on these works, see Buendía, José R. and Gutiérrez Pastor, Ismael, Vida y obra del pintor Mateo Cerezo (1637-1666). Burgos, 1986, pp. 41-49. For more on Cerezo’s drawings, see Piedra Adarves, Álvaro, “Mateo Cerezo, dibujante” in Archivo Español de Arte, no. 290, 2000, pp. 97-115. Palomino de Castro, Antonio, El Museo pictórico y escala óptica. II. Práctica de la Pintura y III. El Parnaso español pintoresco y laureado. Madrid, 1715-1724 [Madrid, Aguilar, 1947], p. 978. The work was lost in the fire in the church in 1936 during the Spanish Civil War. See Buendía, José R. and Gutiérrez Pastor, Ismael, Vida y obra del pintor Mateo Cerezo (1637-1666). Burgos, 1986, p. 147, cat. no. 52. 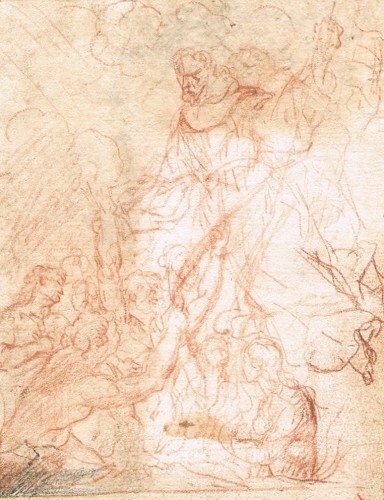 Among the Souls in the drawing, the one that has its arms crossed on its breast at the lower right corner and which does not appear in the final canvas, was used by Cerezo for the Soul in The Judgment of the Soul (Museo Nacional del Prado, inv. no. 620).